MSD offices will be closed on Friday, April 19, 2019 for the Good Friday Holiday. As always, emergency services are available at the number below, 24/7 - 365 days a year. 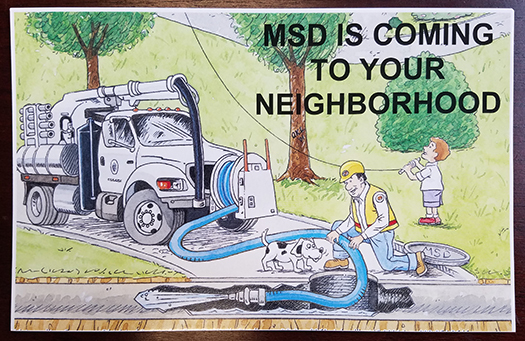 If you have an emergency, call MSD first at 828-255-0061. Don't throw grease or trash down the drain! Learn more about what you can do with your grease and trash by clicking here. New information on Flushable wipes from the NACWA. Click here for more information. Be sure to watch the short clips from The Dr. Oz Show in the link. All documents on this website require a pdf reader. You may download one by visiting FoxIt Software or Adobe. The CIP Committee will meet on Tuesday, April 23, 2019 at 8:30 a.m.
Click here for a study prepared by Raftelis Financial Consultants regarding Sewer System Development Fees. Click here for the FY 2018 System Performance Annual Report (SPAR). Street interruption information due to MSD construction is now available. Click here for more information. Preventive cleaning areas. Click here for more information. Did you receive the following in your mail? If so, click the picture to learn more about what we are doing in your neighborhood. MSD now accepts payment by phone using your Visa, MasterCard, or Discover card. Call 828-225-8234 to schedule your one-time or recurring payment. Any information provided by MSD will be used solely for the purpose of processing authorized payments.